I’ve been to many conferences were successful writers share their tools for writing a novel, and I now have my own set to share. I am working hard to get my current manuscript done – and basic proofreading corrections made – before February 26. The novel is called DNF (Did Not Finish) and it’s middle grade contemporary fiction. Maybe I will post a teaser when it’s out on submission. Because I love checklists and measuring my productivity, I’m using a checklist log to record my daily activity. 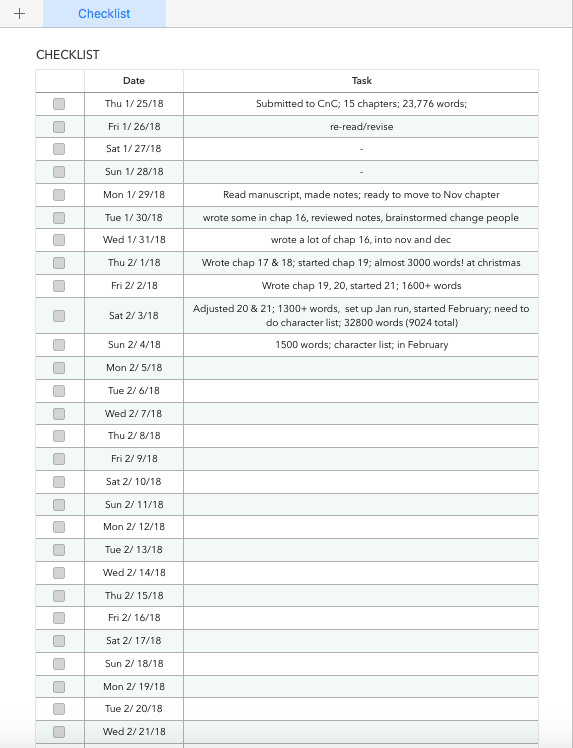 This isn’t a word count tracker, although I do have a handy little Numbers file that can function as a word count tracker just like the one NaNoWriMo provides on its website. I decided not to focus on words for this draft of my manuscript. Instead I focus on WHEN I am in the timeline of the story. I needed some other tools for writing a novel, and because I’m focusing on WHEN, I needed a calendar. 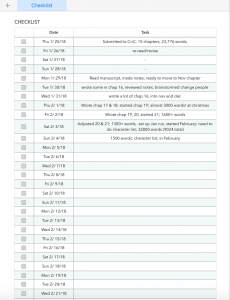 My main character is a runner, so I use a training plan. And because this story has a large cast of characters (many more than in Dare Club) I needed a character list. 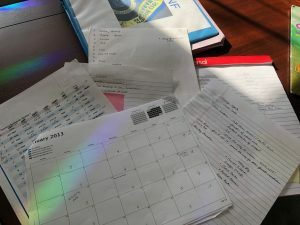 Each one of these tools helps me stay on track, minimize confusion, and prevents the kind of writer’s block that isn’t about ‘not having ideas’ but forgetting where you are in the story. I’ve found the calendar to be especially helpful. My story takes place in a specific year, I use Weather Underground‘s website to find the weather for each of my key scenes. I also look online for popular baby names of the year 2000, and for popular songs, apps, and television shows. I’m sort of a stickler for minimizing anachronisms. 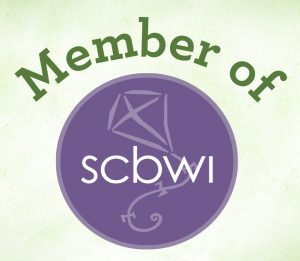 What tools for writing a novel do you use?